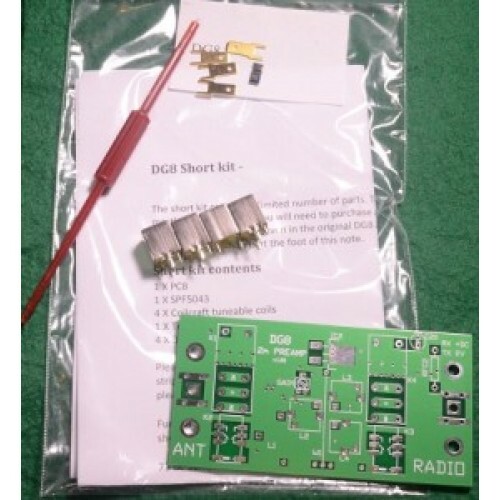 Designed by Ian White, GM3SEK, and based on the front end of the Anglian Transverter by Sam Jewell, G4DDK, the DG8 2 metre masthead mounting preamplifier delivers a high standard of performance and environmental protection. With no exposed metal parts to the pre-amp package, it offers an extremely high degree of corrosion resistance. 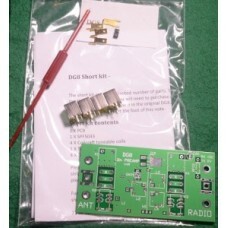 This short kit contains the basic parts for assembly of the DG8 Masthead Pre -Amp by Ian White GM3SEK. To complete the unit you will need to purchase the remaining parts yourself, as described in the Technical Manual. Component references are given as well as stock codes for Farnell and CPC as the main suppliers. do not tin the inner before passing it through the PCB – this will cause it to expand in diameter. make sure that the inner does not need to be forced through the hole in the PCB. it may also be a good idea to leave the dielectric of the coax clear of the PCB on the underside of the PCB by about 5mm, to allow access with a soldering iron – the inner can then also be soldered on the bottom side of the board, which will provide a signal path even if the via does become damaged.